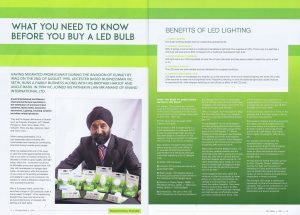 Having migrated from Kuwait during the invasion of Kuwait by Iraq on the 2nd of August 1990, Leicester based businessman Vic Sethi, runs a family business along with his brother Harjot and uncle Babu. In 1994 Vic joined is father in law Mr Anand of Anand International Ltd.
Anand International and Daewoo International (Europe) specialise in the distribution of premium brand batteries, blank media, consumer electronics, lighting, smoking sundries and other related products. They are the largest distributors of brands such as Duracell, Energizer, JVC, Maxell, Panasonic, Rizla, Sony Batteries, Swan, TDK, Verbatim, Rizla, Zig Zag, vapouriz and many more. While running business, Vic is very passionate about working with the communities and charities by contributing time and money towards good causes. When Vic realised that one of the ways to save the world against global warming was to cut down carbon emissions, he decided to invest in good quality LED light bulbs, which the consumers could by at affordable prices. With a European friend, jointly they launched a range of LED products under a brand called “Ecolight”; while distributing Ecolight they have also become exclusive distributors of Duracell LED lighting and flash lights.